The world's largest showcase of civilian and military aircraft and equipment, the Paris air show, has opened at Le Bourget Airport. Some 2,000 exhibitors from 48 countries will be exhibiting their wares to potential buyers and members of the public. This year marks the centenary of the show, which is held biennially and lasts a week. But events have conspired to cast a pall of gloom over this edition of this famous aviation gathering. Normally, billions of dollars' worth of orders flow to manufacturers in every sphere of aviation activity. 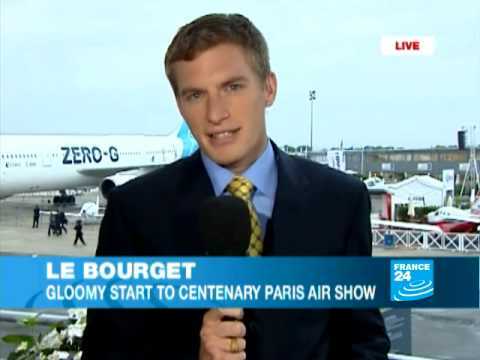 Dismal financial prospects for the airline industry and the puzzling crash of an Air France Airbus have cast a pall over this year's biennial Paris Air Show. Aviation industry executives and analysts foresee few blockbuster orders emerging from the week-long exposition at Le Bourget near Paris, which this year celebrates its 100th anniversary. Grappling with dwindling demand and rising oil prices, the airline industry, according to the International Air Transport Association, could lose 9.0 billion dollars (6.4 billion euros) this year, almost double an estimate made three months ago.